1. 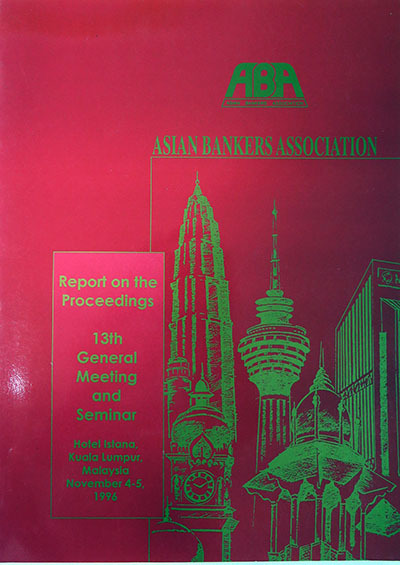 The 13th General Meeting and Seminar of the Asian Bankers Association (ABA) was held on November 3-5, 1996 in Kuala Lumpur, Malaysia. Some 130 representatives from member and non-member banks in the region attended the event which was hosted by the Malaysian Banking Berhad (Maybank). 2. The ABA Board of Directors also held their 22nd and 23rd Meetings in Kuala Lumpur. 4. Several prominent speakers from both the government and the private sector were invited to talk on various aspects of the seminar theme. 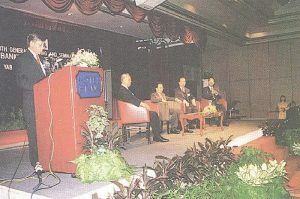 The speakers were requested to examine specific topics such as “Customer Expectations” and “Understanding and Responding to Market Signals.” They were also asked to give their views on “Operational Challenges” which the banking industry faces and ways in which financial institutions can work together to ensure that the region is ready to face this changing environment. The full text of the seminar papers will be published in a future issue of ABA Journal on Banking & Finance. 5. Amirsham A. Aziz, Managing Director of Maybank, gave the Welcome Remarks. Mr. Aziz said that as one of the fastest growing regions in the world, Asia continues to be the focus of international attention. He stressed that if banking institutions are to benefit from this growth process, it.is imperative that the financial institutions operating in the region establish a collaborative framework. 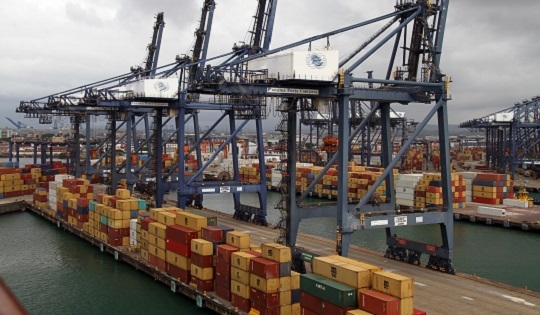 Such networking will prove useful not only in reinforcing individual capabilities but also in surmounting the different and difficult challenges faced by us arising from the globalisation of the industry. Mr. Aziz expressed hope that the seminar represents one small step in that direction. The full text of Mr. Amirsham’s Remarks appears as Annex I. 6. The seminar was made doubly significant by the presence of Dato’ Seri Anwar Ibrahim, Deputy Prime Minister and Minister of Finance, Malaysia, who delivered the Opening Address. The Deputy Prime Minister noted that the focus of international investors now seems to be on the financial services sector and that bankers and financiers, therefore, need to strategise to ensure that these opportunities do not pass them. Mr. Anwar also called on Asian countries to play a more proactive role in the formulation of multilateral arrangements, such as the General Agreement on Trade in Services and the ASEAN Framework Agreement on Services, which represent major steps towards globalisation of financial markets. He also identified areas for further cooperation, such as in the mobilisation of financial resources for infrastructural development and in regional syndication of large-scale project financing, formation of strategic alliances and smart partnerships. Noting the continued reliance on international capital flows to meet the financing requirements of the region, Mr. Anwar underscored the need to intensify measures to increase the level of domestic savings and provide a more efficient infrastructure so that there can be better intermediation of savings to productive investment activities on a regional basis. The Deputy Prime Minister also remarked that as banking institutions continue to identify better and more cost-effective ways of delivering their services, information technology will increasingly become a vital strategic tool for the banking industry. 7. ABA Chairman Dr. David K. P. Li, in his Keynote Speech, cited some of the economic and social challenges that the region is likely to face in the near future. He also noted the difficulty of forecasting the impact of these challenges on the banking industry. Among these challenges, he said, are the changes in the demographics, notably the rising number of old people in many countries in the region; the coming down of many of the traditional barriers in the retail market as well as between lending and the capital markets; greater competition in the banking industry; and the increasing riskiness of the banking business. While these emerging issues and the potential problems and concerns they create can cause sleepless nights to bankers, they also present exciting opportunities in terms of technology innovations, manpower training, product development and customer relations. Dr. Li stressed that Asia in the next century will rely on its banks far more in the past in addressing these issues. Banks will play an important role in solving problems relating to the region’s aging population and in meeting the massive financial requirement of the region’s infrastructure development, he said. Dr. Li concluded that Asia’s future success depends, in no small part, on the region’s banking industry. 8. Session 1, which was moderated by Mr. Michael J. Liley of National Australia Bank, focused on “Customer Expectations” and featured two speakers. Dr. R. Thillainathan, Finance Director, Genting Berhad, talked about technological innovations and how they are expected to change dramatically the business of banking. Smart cards would become the primary vehicle for delivering transaction and information services. In order to remain competitive both in the domestic and foreign markets, banking institutions would rely more heavily on information technology to reduce operational costs and enhance customer and to provide new banking products to gain market share. with respect to the regulatory environment, Dr. Thillainathan called for the elimination of capital controls for the benefit of borrows and investors. He said that if Asian producers and consumers, as well as borrowers and investors, are to be competitive vis-a-vis their Western counterparts, unnecessary restrictions should not be placed on market activities. 9. Dominic Casserley, Director, McKinsey & Co., Inc. said that the next ten years will see the emergence of a sophisticated customer, one that is more educated, wealthier, and more exposed to global trends. This changing customer profile will bring about a higher degree of competitiveness and a need for change in order to meet new customer demands in terms of services, products and distribution channels. For private banking in particular, the forces at work will include a growing market, aggressive competition, and a demand for increasingly complex products from an increasingly complex client. Mr. Casserley said that these market forces will create attractive but multi-faceted and complex opportunities. 10. Session 2 was moderated by Dr. Chong Kwong Yuan and presented two speakers who shared their views on the topic “Understanding and Responding to Market Signals.” Steve Chou, Assistant Executive Vice President, Consumer Lending, Chinatrust Commercial Bank, spoke about retail banking in the 21st century from Taiwan’s perspective. Mr. Chou identified four major challenges retail bankers in Taiwan will have to deal with in order to survive in the new environment. These include: (a) the need to establish a business culture that is innovative, service oriented, sales oriented, and market oriented; (b) the need to continuously reengineer the business to find the best-fit and cost-effective organization and infrastructure; (c) the need to properly manage customer relations and create customer intimacy in a profitable and sustainable way; and (d) the need to successfully deploy and harness technology in a fast, user/business-driven manner. 11. Hisao Kobayashi, Chairman, The CIT Group Holdings, Inc. and Senior Adviser of the Dai-ichi Kangyo Bank, Ltd., gave his thoughts on what lies ahead in financial services. Mr. Kobayashi named three major trends affecting the business of banking today: globalization, deregulation, and a heightened focus on profitability and return on capital. Within all these trends, the impact of technology is a common thread, he said. Mr. Kobayashi proceeded to discuss the positive impact of these trends on non-traditional financial products, focusing on asset-based lending particularly consumer finance, factoring, and leasing. 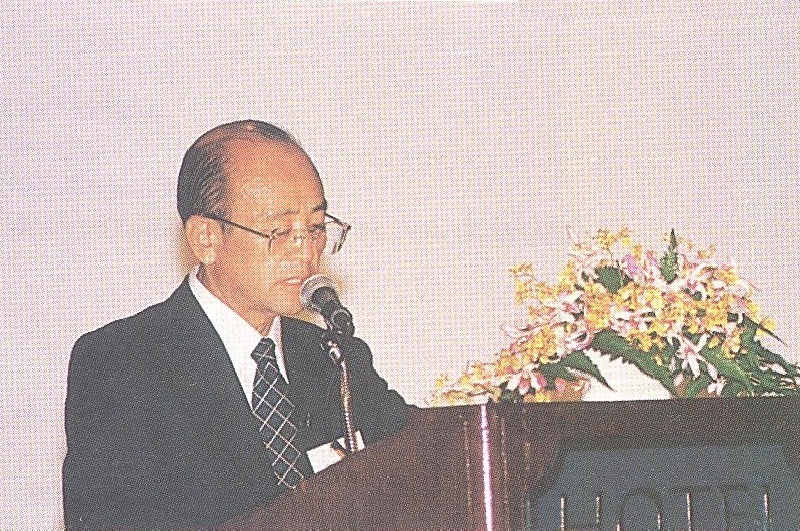 To remain competitive in this “new world order of banking”, Mr. Kobayashi suggested some paradigm shifts need to occur, namely: (a) from a transactional mentality to a value-added mentality; (b) from production orientation to marketing orientation; (c) from domestic to global focus; (d) from the do-it-yourself model to the strategic-alliance model in approaching the less developed country markets; (e) greater use of technology for greater efficiency; and (f) from doing what one has become accustomed to – and failing – to doing what is possible. 12. Session 3 was moderated by Mr. Amirsham Aziz of Malayan Banking Berhad and featured presentations by two speakers who discussed the topic “Operational Challenges”. Colin Carter, Senior Vice-President of the Boston Consulting Group, talked about the challenges faced by bank managers in the 21st century and suggested some measures and approaches that management may wish to consider to meet these challenges. Among the challenges, according to Mr. Carter, are the rapid, large-scale changes in the business environment; competition from specialists and niche operators; industry consolidations and merger and acquisition activities; the need to build a “shared” vision”; the need to manage complexity; technology development; and greater activism on the part of shareholders. 13. Dato’ Fong Weng Phak, Deputy Governor, Bank Negara Malaysia spoke on current trends in banking and some of their implications from a regulatory perspective. Specifically, Dato’ Fong discussed the impact of market changes, such as growing market competition and pressure for liberalisation from the WTO, on the relationship between banks and regulatory authorities. He also touched on the direct impact of market changes and technological progress on the operation of the regulatory authorities themselves. Dato’ Fong stressed that for regulators, the aims of regulation will continue to be the protection of the general public, ensuring the stability of the system, strengthening banking institutions to meet competition, and in many cases promoting national development objectives as well. The appropriate balance between regulation and free market competition depends very much on the circumstances in a country and the manner in which this balance is maintained, he concluded. 14. The 13th ABA General Meeting was held on November 5, 1996. Presiding over the Meeting was Chairman Dr. David K.P. Li. Dr. Li summarized the activities of the ABA over his two-year term, highlighting the annual general meetings which he said have been useful in enabling members to share experiences and ideas; the training courses with the AIM and the IBF; the continued expansion of membership; and the creation of a Special Committee on APEC Matters which subsequently submitted recommendations to APEC on banking and investments in the region. Dr. Li also noted the sound financial conditions of ABA. 15. In his Valedictory Remarks, Dr. Li called on the members to give the new officers the same support that they have extended him and his colleagues. He also thanked the members for their support of the projects undertaken during his term and extended particular gratitude to the Board Members for their cooperation in implementing the programmes of the last two years. 16. Mr. Tetsuya Horie, as Chairman of the Election Committee, reported on the results of the canvassing of ballots conducted two days earlier, and presented the names of the 25 banks which obtained the most number of endorsements. The General Meeting unanimously elected the 25 nominees to sit in the Board for the period 1996-1998.
b. Adding a new section allowing banks or financial institutions which do not have presence in Asia and which sympathizes with or supports the objectives of the Association to become Regular Members, subject to certain limitations. 18. Mr. Peter B. Favila and Mr. Amirsham Aziz were formally sworn in by Dr. Jeffrey L.S. Koo as Chairman and Vice-Chairman, respectively, of ABA for the term 1996-1998. 19. Per resolution passed during the 22nd Board Meeting, a plaque of appreciation was presented to Outgoing Chairman Dr. David K.P. Li in recognition of the important role he played in the development of ABA during his two-year term. 20. In his Acceptance Speech, Mr. Favila reminded members of their obligation not only to monitor the rapid developments that are taking place in Asia today but also to actively participate in shaping the future of the region. As bankers, ABA members can do a lot to expedite the development of lagging industry sectors and to further the globalization of Asia, he said. Mr. Favila also encouraged the setting up of an effective information exchange system among members to ensure the success of any economic cooperation in the region. e. That the 14th General Meeting and Seminar in 1997 will be held in Moscow subject to completion by the host bank of certain requirements sought by the Board. 22. The Meeting also presented a plaque of appreciation to the host bank, Malayan Banking Berhad, for the warm hospitality extended to the participants and the excellent arrangements made for the meeting. The plaque was received by Mr. Amirsham Aziz on behalf of Maybank. a. Report of the Secretary- Treasurer – The Meeting noted the activities of the ABA during the past two years including, among others, the successful sponsorship of training courses with the AIM and the IBF and the submission to APEC of recommendations on investment protection in the region. The Meeting also noted the Financial Statements of ABA for the period January to August 1996 and the Audited Report on the Financial Status in 1995, and commended the Secretariat for its prudent handling of the association’s finances during the period. b. Membership – The Meeting ratified the application of new members and accepted membership withdrawals. 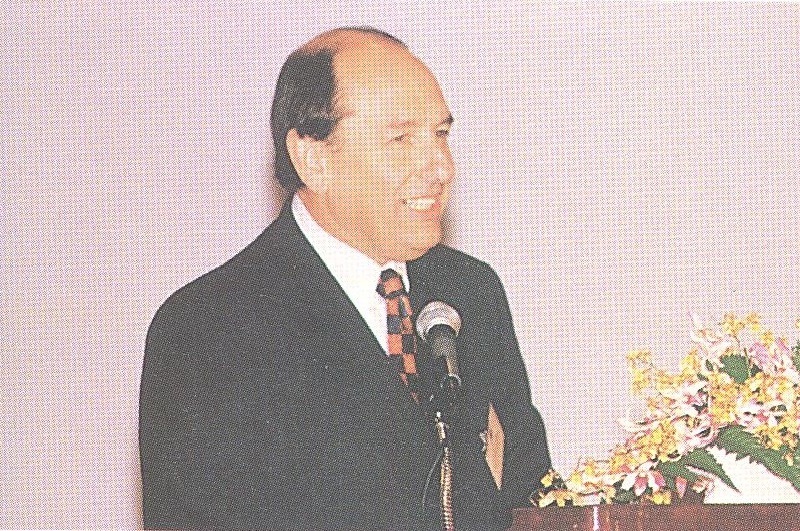 The Meeting expressed satisfaction over the net increase in membership to 194, which was just six short of the target of 200 for 1996.
c. Report of the election Committee – The Meeting endorsed the 25 nominated banks recommended by the Election Committee to the Board for the period 1996- 1998. The Meeting noted that the nominees were selected on the basis of the results of the initial part of the election held earlier in the day as well as on the 1994 decisions of the 11th General Meeting with respect to the size and composition of the Board. a. 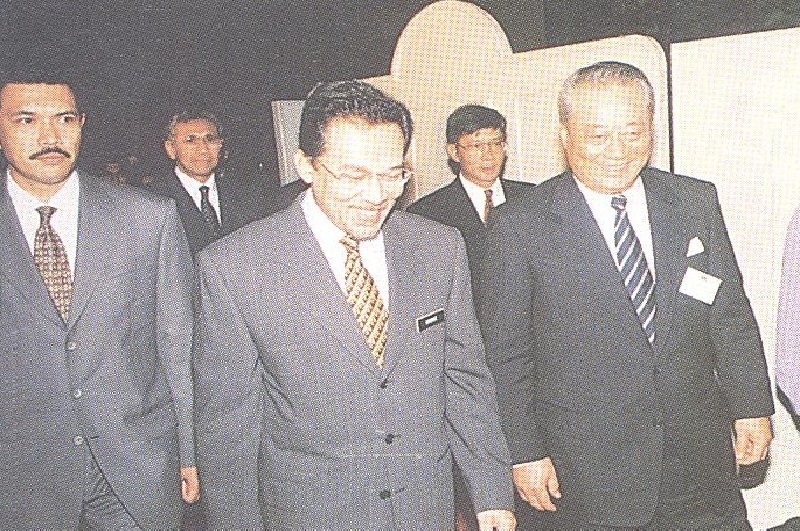 Election of New Officers – The Meeting, upon the recommendation of the Advisory Council, elected Mr. Amirsham Aziz, Managing Director and CEO of Malayan Banking Berhad, as Vice Chairman for 1996-1998.
b. Vote of Thanks to Outgoing Chairman – The Meeting adopted the resolution for a vote of thanks and for a presentation of a Distinguished Service Award to Outgoing Chairman Dr. David K.P. 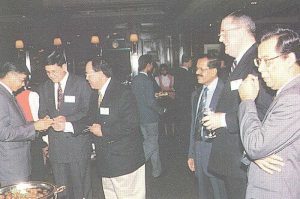 Li in recognition of his eminent leadership and distinguished service as Chairman of the ABA for 1994-1996. The Meeting agreed that a plaque be presented to Dr. Li at the 13th General Meeting. v. Hiring of a banking expert to conduct research and prepare position papers for the ASA that may be submitted to international organizations! such as APEC. 25. 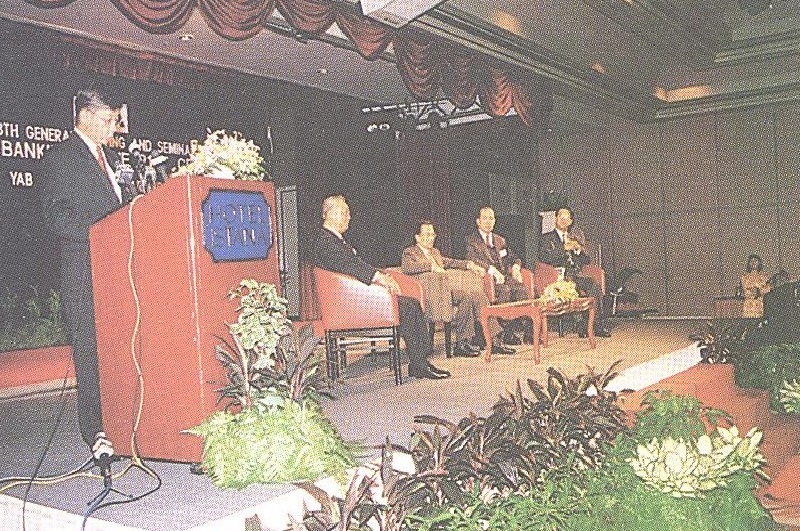 The 23rd Board of Directors’ Meeting was held in the morning of November 5, 1996. It was chaired by the newly elected Chairman, Mr. Peter B. Favila. a. Programme of Work 1996-1998 – The Meeting endorsed in principle the proposed Programme of Work for 1996-1998 as prepared by the ABA Secretariat. A Planning Committee would be created to flesh out and finalize the Programme of Work. b. Budget for 1997 – The Meeting approved the proposed Budget for 1997, and expressed support for the proposal to hire a professional expert to assist the Secretariat in drawing up activities and projects for ABA to make productive use of the Association’s growing surplus. d. Venue and Date of Next Meeting – The Board decided to hold the 14th General Meeting and Seminar in early September 1997 in Moscow, subject to compliance by the host bank of certain requirements.